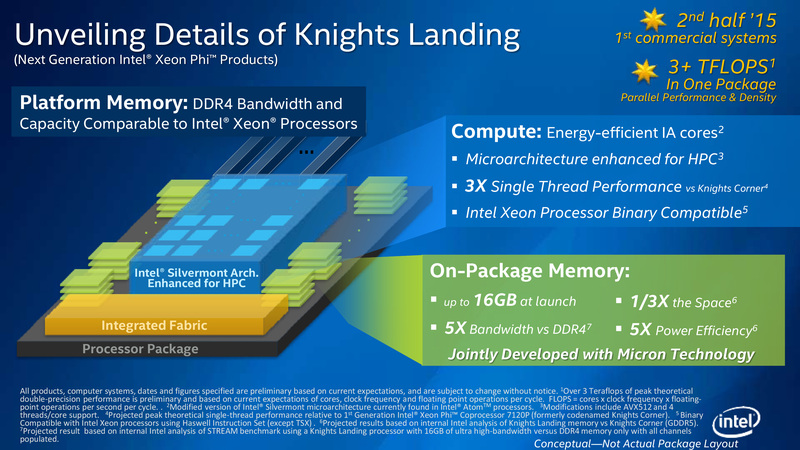 Intel has announced that it had discontinued its Xeon Phi 7200-series coprocessor cards codenamed Knights Landing. The PCIe cards have never became mass market products, so their EOL will hardly be noticed by many. The company says that adoption of its Xeon Phi 7200-series processors in LGA3647-1 form-factor is growing and it does not believe that the PCIe versions will become nearly that popular. The products in question are the Xeon Phi 7220A, 7220P and 7240P coprocessors, which were used for software development by various close partners of Intel, but were never released as commercial products (even though TYAN was ready to support Intel’s PCIe coprocessors). With that in mind, Intel discontinued the SKUs on August 24 immediately without initiating a lengthy EOL program that would enable partners to order additional units, presumably because none of the cards were ever shipped commercially in any viable quantity. By contrast, Intel's Xeon Phi 7200-series CPUs are shipping and will be available going forward. Before Intel initiated the EOL process for the Xeon Phi 7220A, 7220P and 7240P add-on cards, the company removed references about the boards from its website. When asked about the reasons, an Intel representative said that the chipmaker decided not to offer the products for the general market, but Xeon Phi remains a key element of Intel’s product stack. “Intel continually evaluates the markets for our products in order to provide the best possible solutions to our customer’s challenges. As part of this on-going evaluation process Intel has decided to not offer Intel Xeon Phi 7200 Coprocessor (codenamed Knights Landing Coprocessor) products to the market. Given the rapid adoption of Intel Xeon Phi 7200 processors, Intel has decided to not deploy the Knights Landing Coprocessor to the general market. Intel did not provide an exact reason for why it decided not to make the Xeon Phi 7200-series cards available for the mass market. But here is some food for thought. 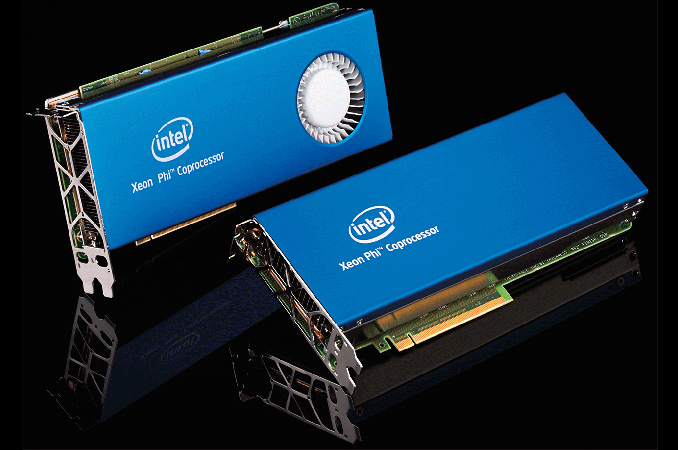 Compute performance of the Xeon Phi 7220A, 7220P and 7240P PCIe coprocessors is slightly under 3 TFLOPS FP64, which is below 3 – 3.4 TFLOPS offered by numerous Xeon Phi LGA processors. Furthermore the coprocessor cards by their very nature have much more limited I/O options than their socketed counterparts, relying on a single PCIe x16 link back to the host, versus a socketed processor having 36 PCIe lanes of its own to directly attach to peripherals. Conversely, socketed Knights Landing doesn't support multi-processor setups (there's no QPI link), so the coprocessor cards could be used for density, just with much more limited connectivity. Given that HPC is a key element for Xeon Phi, one could consider density being a key angle for the product, so discontinuing the PCIe product (via a forum post intially then a PCN but still no press release) seems a little odd. At least for now, Intel does not want to compete against add-on PCIe compute accelerators with its Xeon Phi products. A big question is whether it actually needs to, given the stand-alone capabilities of Xeon Phi and its performance characteristics. But that is a completely different conversation. It didn't sell at all. It's so grossly uncompetitive with AMD and NVidia, they made the right move not putting this on the market. Intel is years behind in parallel performance, it's actually pretty embarrassing when you consider they nix'd their mobile (SoC) development as well. Market cap is one way to look at it, but look at employee count - Intel dwarfs Nvidia, and to a lesser degree Qualcomm. The die cost of the x86 instruction set architecture is fairly trivial these days. Most of the die is take up by cache, I/O logic (PCIe, memory, QPI, OmniPath, on-die ring/mesh network, etc), and vector units.